On eCommerce sites, up to 30% of visitors will use the site search bar to navigate. These users are showing a clear intent to purchase by entering product names they may wish to browse. Therefore, you want to ensure you’re making the most of it and create the best experience for your visitors. This probably sounds simple but it’s very important - make it easy to find. If the user can’t find the search bar, you could be losing out on that potential extra 30% of sales. 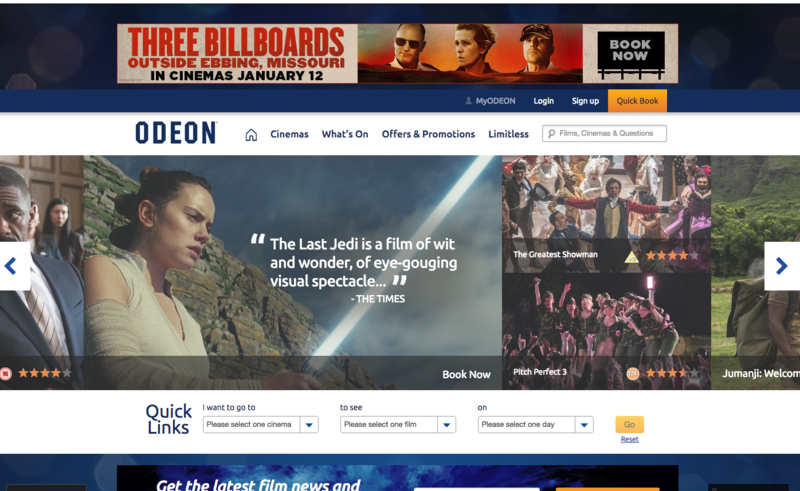 It doesn’t necessarily need to be too big or bold but users should be able to find it quickly when they arrive at a page and look around. 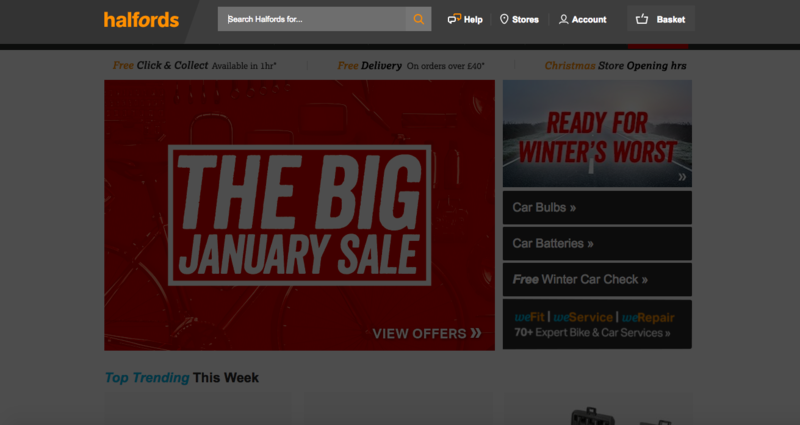 Here, Halfords have gone as far as to dim the rest of the site when a user clicks on the search box. The position of the search box on the site can influence the user's decision to make use of it to look for products. Navigation should be clear across the entire site, including the site search boxes. This is so that visitors can move around easily, whichever page they happen to arrive at. However do bare in mind that you want to avoid any confusion on your site. So to do so, make sure you do not locate the search bar too near to other boxes, such as newsletter sign-ups or postcode searches for stock information. If I were the user and I typed in ‘red’, not only do suggestions appear, such as ‘red crop top’ and ‘red denim skirt’ but images appear too which makes the experience for the user better as they get to instantly preview the items. Whether a customer clicks or leaves your website can be down to your search results page. Not only do you want the searching experience to be easy and hassle free, you want to bring up relevant results. With a good site search engine, you should be able to customise your users search to great deal. For instance, if you were a womens fashion retailer, one of your visitors could search for ‘black dress’ and all black dresses would appear. I have used retailer ASOS for this example (see images). That user should then be able to filter their search more by features such as size, length (do they want a midi, mini or maxi length? ), price and so on. Using filters helps to narrow down the options available for the customer so they aren’t overwhelmed and can therefore find their desired item faster. You can see that just by adding a few filters the search for black dress has gone down drastically. Some tools you should be taking advantage of are Google Analytics and Google Keyword. The majority of search engines or hosted searches will keep a list of search terms that users have been looking for on your website. This is a great way to keep track of what the most popular items are and you can see what users are after. With this information you are then able to place these items nearer the top of search results. It can be very irritating when a website produces breadcrumbs like Home > Search > Your Search Result. But leaving the right breadcrumbs can make the users life much easier. People use them to get a more precise search. Helpful breadcrumbs allow people to search without clearing everything and starting from the beginning. 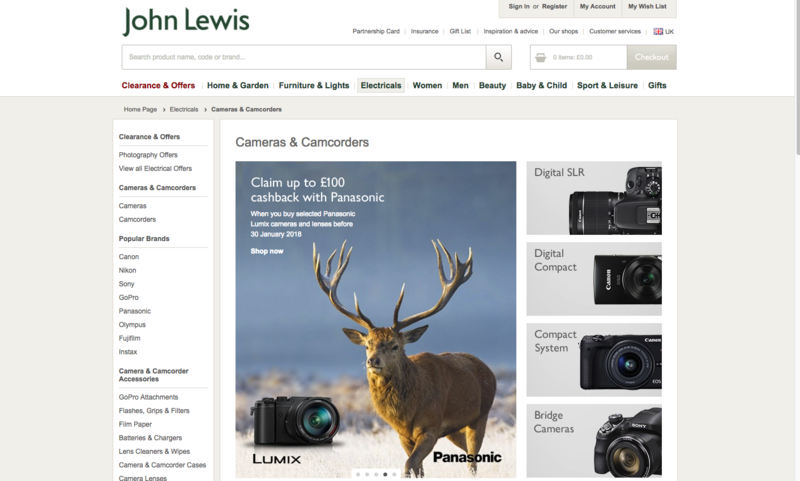 For instance, using this John Lewis camera search query, we can see that convenient breadcrumbs have been left on the site. 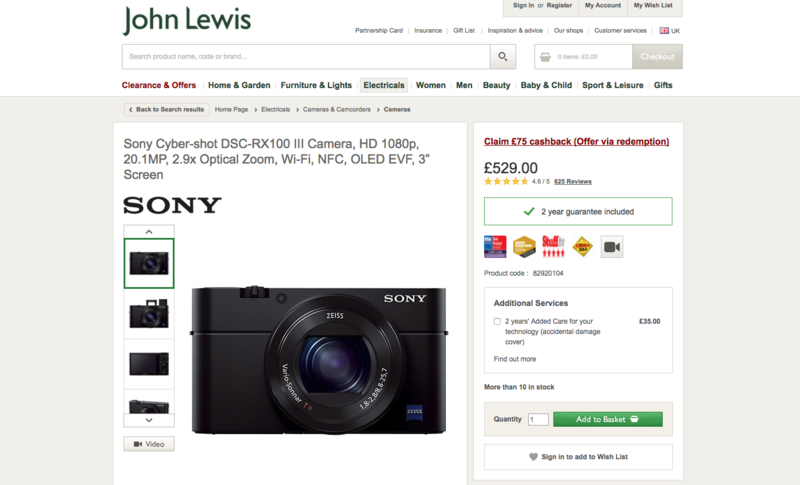 The item selected while browsing, in this example the Sony camera, might not be exactly what the customer is looking for, therefore leaving useful breadcrumbs such as ‘Cameras & Camcorders’ or even ‘Electricals’, makes searching easier. Furthermore, a faster and hassle-free shopping experience will more likely result in a sale. Or risk losing revenue. There is correlation between the amount of users who purchase something from your website and the load time. The same is true for search results. When load times increase, profit decreases. Amazon reported that “one additional second would cost them $1.6 Billion dollars in sales”. Therefore, run tests and ensure your load time is acceptable - this includes checking the load time on mobile devices. When considering search result load times, even loading time by half a second can be detrimental. In 2012 Google conducted an experiment on search results by increasing results from 10 to 30. The outcome showed that revenue and traffic decreased by 20% because the additional search results took milliseconds longer to load. Placing suggestive text in your search bar will encourage or prompt the user to search for something on your website, but make sure you limit your hints to just a few words. Not only does a sample search query give them suggestions but it also makes it clear on what they can search for on your website and how many criterias are available. 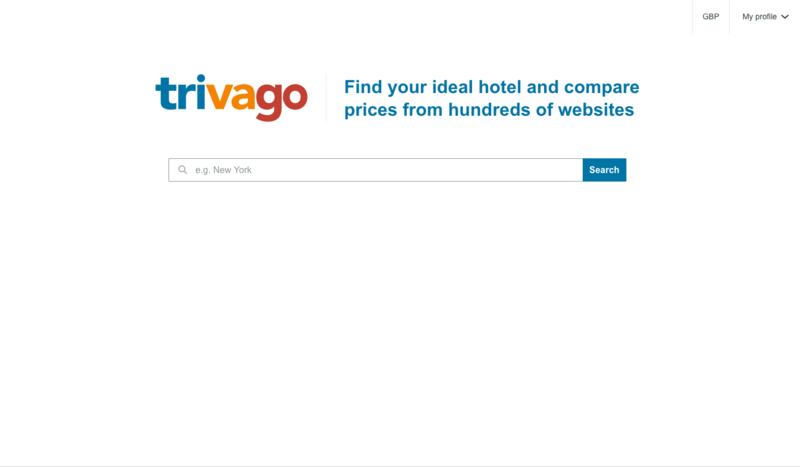 For instance Triavago.co.uk search for hotels and have given ‘New York’ as their search sample, whereas Odeon have given multiple samples, ‘Films, Cinema’s and Questions’.